It’s Jimmy V. Week and the college football regular season has come to end. That means college hoops takes center stage at universities across the country and we couldn’t be happier. Let’s get to the breakdowns. The big question in the Georgetown-Texas game is where are the points going to come from on both sides. The Hoyas are coming off the ugliest game college basketball has seen in quite some time. While they beat Tennessee on Friday night by a score of 37-36, coach John Thompson III cannot be happy with how his team is performing on the offensive end. On the other side, the Longhorns are struggling to score as well. They are shooting an eFG% of 48.7% on the season against teams like UT-Arlington, Sam Houston State, and Chaminade (a game in which they lost). Expect this game to be a defensive slugfest. No one wants to see a disaster similar to Georgetown-Tennessee, but this game has that kind of feel. The Hoyas have the length advantage once again in this match-up and should be able to take advantage on the boards, and it’s unlikely that Georgetown forward Otto Porter will be held in check again. So keep a close eye on how he responds to his eight-point performance on 4-11 shooting against the Vols. While the Texas defense has been strong, their competition does not give us much to go on. The Longhorns will continue to struggle without point guard Myck Kabongo in the lineup regardless. Since UConn’s surprise win against Michigan State in the opener, the Huskies have come back to earth and played very mediocre basketball. A close win against Quinnipiac and a loss to New Mexico showed that Kevin Ollie’s team still has a lot of work to do. NC State is on the verge of a very disappointing non-conference season already with losses to Oklahoma State and Michigan, and a too-close-for-comfort game against UNC-Asheville. The good news for the Wolfpack is that their offense performed much better against Michigan, shooting almost 60% eFG in the loss. Look to see if they can put together a complete game for the first time this season against a quality opponent. The guard match-ups between UConn’s Shabazz Napier and Ryan Boatright and NC State’s Rodney Purvis and Lorenzo Brown should be fun to watch. 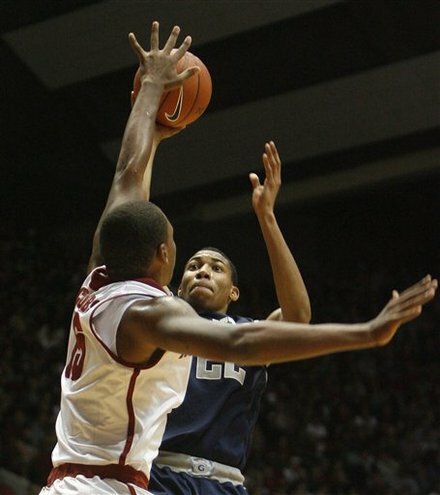 However, the difference in this one should be the Wolfpack’s frontcourt of C.J. Leslie and T.J. Warren. NC State just has more scoring options across the lineup than the Huskies. Ethan Back is the MAC correspondent for RTC. Will Ohio Be Able to Reach the Sweet Sixteen Again? After an extremely successful season that ended in an overtime loss in the Sweet Sixteen against ACC power North Carolina, Ohio will look to make another deep NCAA Tournament run. The Bobcats have a lot of hype to live up to, as they return all of their significant contributors from a season ago, including standouts D.J. Cooper and Walter Offutt. Not all of the personnel returns from a season ago, however, with former head coach John Groce now at Illinois, but new head coach Jim Christian will look to keep momentum going. Toledo’s Postseason Ban: Toledo has a very solid core intact from the 2011-12 season, so it’s a real shame that the Rockets won’t be able to qualify for postseason play due to its academic problems. Luckily for the Rockets, two of its best players (Rian Pearson and Julius Brown) are underclassmen, so they’ll still get a chance to win the MAC Tournament in future years, assuming they stay in school beyond the 2012-13 season. East vs. West: Last season, the East had five teams finish with a winning record, whereas the West had a measly one. This clear imbalance within the MAC doesn’t have serious ramifications, as the conference tournament seeds are not based on division, but for the sake of self-respect, the West will hope to have a better season than it did last year. No More Zeiglers: Winning games hasn’t been an easy task for Central Michigan these past two seasons, as its 12-20 conference record during that span indicates. It won’t be any easier this year after the firing of head coach Ernie Zeigler led to the transfer of his son and the Chippewas’ leading scorer Trey Zeigler to Pittsburgh. New head coach Keno Davis brings great experience to the program, but his first season on the job will likely be a rough one. Before Kendall Marshall‘s injury, this was a very tough match-up for the Bobcats. With Marshall’s injury, it’s still a tough match-up. There are several things going against Ohio in this match-up, but the toughest to overcome is simply size. Reggie Keely is a big body at 6’8″ and 263 pounds, but the rest of the line-up is shorter and lighter. Against the NBA-caliber size of North Carolina, this will be a problem, particularly for a team that struggles with defensive rebounding as it is. Worse, against the foul-drawing bigs of North Carolina, Ohio may quickly find itself in foul trouble. Ohio is easily the most foul-happy team left in the tournament, and Keely fouls 5.1 times per forty minutes and the rest of the front line posts similar marks. If Ohio can’t hold the interior against North Carolina, there is little to stop Tyler Zeller for going off for the game of his life. Marshall May Not Play, But How Will Ohio Deal With UNC's Big Men? Still, despite this distinct mismatch, Ohio comes into this game with a set of skills that could make life miserable for the Tar Heels. As a team, the Bobcats force turnovers on over a quarter of all possessions, and over the season have turned over offenses at the second best rate in the entire country. North Carolina, despite its fast pace, was one of the better ball-control teams in the country this year, and a lot of that credit goes to the masterful generalship of Marshall. Without the team’s 35 MPG point guard (or his back up), the Tar Heel’s of a distinct lack of battle-tested and sure-handed ball-handlers. Stilman White, Justin Watts, and (I suspect) Harrison Barnes are all but certain to endure hellacious ball-pressure as Ohio tries to leverage North Carolina’s inexperienced ball-handler into frequent turnovers and easy fast-break points. The success of both teams likely hinges on the ability of North Carolina to successfully break pressure, play out of traps, and otherwise initiate the Tar Heel offense before the ball hawks of Ohio make the big play. Ohio’s Guards were Fantastic. It’s not easy to win a third round game in the NCAA Tournament when you get 11 points from your frontcourt. 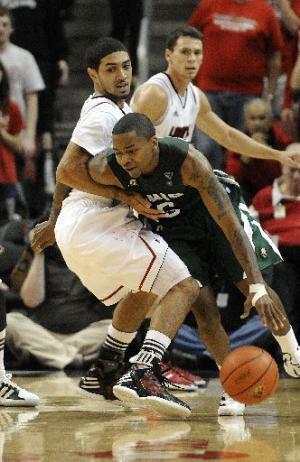 But that’s exactly what Ohio did tonight, thanks to its stellar backcourt and the outstanding performances of D.J. Cooper and Walter Offutt. The pair combined for 40 of Ohio’s 62 points and got nine more from the team’s third starting guard, Nick Kellogg. South Florida did a much better job than Michigan of disrupting the flow of Ohio’s offense, especially in taking Ohio forward Ivo Baltic and the rest of the Bobcat frontcourt out of the game, but the Bobcats shot 50% from the floor in the second half and were able to get more open looks. The Bobcat backcourt was simply too good on this night, and Cooper and Offutt are the biggest reason Ohio is moving on to its first Sweet Sixteen since 1964. Five-point Possessions turn Game. It’s not often that you see a five-point possession in a game. It’s downright rare that you see two in one half, but Ohio had two such possessions in the second half and they were game changers. The first came with 16:03 remaining when Victor Rudd, Jr., was called for an intentional foul on Walter Offutt after he grabbed Offutt on the perimeter. Offutt made both free throws and then knocked down a three from the left corner to tie the game. Then, with 9:23 left, Jawanza Poland was on the receiving end of a beautiful alley-oop pass from Collins and was called for hanging on the rim by referee Tony Greene. It was a questionable call, and it took away South Florida’s momentum. The Bulls had taken a 42-37 lead on the play, but Kellogg knocked down both technical free throws and made a three to tie it back up. The play sparked a 19-6 run that gave Ohio a lead it would not relinquish. South Florida’s Offense not Enough. The Bulls play ugly and get the job done on the defensive end. Offensively, though, they simply weren’t worthy of a Sweet Sixteen run, especially on the perimeter. For the game, South Florida went 2-15 from three-point range, and many of those misses came on good looks. Had they been able to knock down a few more of those shots, the early second half lead may have been too much for Ohio to overcome. Instead, their inability to make enough shots ended the Bulls’ season. Star of the Game. Walter Offutt, Ohio. The Bobcat junior, who spent his first two years at Ohio State, showed why he was a high-major recruit in this game, going 7-9 from the field and scoring 21 points. He hit all four of his three-point attempts. This honor easily could have gone to Cooper, who had 19 points and seven assists, but on this night, Offutt provided the offensive spark that carried the Bobcats to St. Louis. Quotable. “I don’t ever want to blame one play, but it certainly changed the momentum. All season long, we didn’t let one play bother us, but we did here. The response was not normal for us.” – South Florida Coach Stan Heath, on Poland’s technical. Sights and Sounds. St. Patrick’s Day came a day late, as green was everywhere in this one. Even the NCAA got into the act, assigning referee Tony Greene to the game. Wildcard. In the Twitter era, news travels fast. At halftime, the media room was abuzz with word of North Carolina guard Kendall Marshall‘s fractured wrist, and the general consensus was that the Tar Heels’ chances of winning the national title are over if Marshall can’t play or perform at his usual high level. What’s Next? Ohio has a huge challenge ahead, as it gets to take on the region’s top seed, North Carolina. Of course, no one knows what the Tar Heels will look like at this point, given Marshall’s injury. Still, despite the fact that Ohio’s backcourt is superb, the Bobcats’ lack of size will be a big problem against the huge North Carolina front line. Here are few thoughts on Friday’s NCAA Tournament action in Nashville, and a look ahead to Sunday’s action. 1) The first thing that stood out in watching the eight teams in the NCAA Tournament pod in Nashville was the level of parity that was on display, and which is prevalent throughout college basketball. In the first half of the day’s first game, the East Region’s #11 seed, Texas, took futility to a new level, hitting 4 of 25 shots on its way to a 31-17 halftime deficit against #6 seed Cincinnati. After falling behind by 19 early in the second half, the Longhorns eventually tied the game, which wasn’t decided until the final minutes. In the nightcap, South Florida, the #12 seed in the Midwest Region, made Texas look efficient by going 3 for 27 and scoring 15 points in the first half. Somehow they trailed Temple by only four, and the Bulls came out of the locker room on fire and shot 60% for the second half on their way to a 58-44 win over #5 seed Temple. That was the largest spread of any of the final scores here. Each of the day’s games was up for grabs going into the final minutes. Beyond the obvious – that #12 and #13 seeds won here on Friday, and that two #15 seeds won elsewhere on the same day – it is apparent that the disparity in talent between the mid-majors and the BCS schools continues to narrow. In watching teams in a pod in which there were no 1-16 or 2-15 matchups, it was clear that parity abounds. St. Bonaventure, the East Region’s #14 seed and the lowest-seeded team here, played ACC Tournament Champion Florida State to the wire and easily could have won the game. The Bonnies were the fourth-best team in what many consider the best mid-major league – Atlantic 10 – and they were able to control most of their battle with arguably the ACC’s best squad. And while it would have been an upset, no one here would have been shocked if it had happened. St. Bonaventure had good players, including the sensational Andrew Nicholson, and the overall difference in talent levels between the two squads was not as vast as it may have been in the past. Transfers are also an important part of this equation. Case in point is Ohio forward Walter Offutt, who left after two years at Ohio State in which he rarely saw the floor. Offutt, a top-100 player coming out of high school, is one of many former high-major players we have seen over the years make a difference at the mid-major level. He is flourishing in Coach John Groce’s system and is the team’s second leading scorer. While he couldn’t get into the rotation in two years in Columbus, Offutt has flourished in relative obscurity in Athens. He is the type of player that allows a team like Ohio to compete when it faces better competition in March. Upsets have long been a part of March Madness, but as we see more of them, we should be less surprised. The George Masons, Butlers, and VCUs of the world have shown us that there is plenty of talent outside the BCS leagues, and the parity on display in Nashville on Friday typified that. After another impressive road victory, it’s time to get Ohio University on the national radar. The Bobcats of the MAC improved to 10-1 with Tuesday’s night’s impressive win over Northern Iowa, another one-loss team coming into tonight’s game. Ohio entered the contest as six-point underdogs and left with a 17-point victory. They have now won road contests over Oakland, Marshall, and UNI, and they had a five-point lead at Louisville with under three minutes to play before poor execution down the stretch lead to a late loss. That near-upset remains the Bobcats’ only loss of the season. Ohio has passed all of its major non-conference tests with flying colors, and they certainly look the part of an NCAA Tournament team. Barring a stunning loss in one of their next three home games against weaker opponents, star point guard D.J. Cooper and his team will head into MAC conference play as the league favorite and with a good resume worthy of at-large bid consideration. Ohio is led by the junior guard Cooper who simply does it all. The 5’11”, 165-pounder doesn’t have the physical make-up of a high major player, but he’s been as productive as any guard in the country. His playmaking skills on both ends of the floor have been remarkable. Cooper led the entire country in total steals as a freshman, not to mention finishing the season with a 13/5/6 APG average that season. As a sophomore, Cooper accumulated the second-most assists in the nation, dishing out 7.5 per game. He’s back at the task this year, contributing across the board with 14.6 points, 6.4 assists, 4.5 rebounds, and 2.5 steals per game. His one struggle is shooting the ball from deep, where he’s made just 30% of his career three-point shots despite attempting over five per game. If he were ever to cut down on his volume of deep shots, then we’d be looking at an even more dangerous player. Fordham transfer player Jio Fontan has resurfaced all the way across the country at USC, and he will be eligible to play next season at the semester break. This is a good pickup for Kevin O’Neill, as Fontan averaged 15/5 assts in a season-plus at Fordham and will be able to move into the PG slot vacated by Mike Gerrity. Speaking of USC, the self-imposed sanctions on the basketball program may not become official until February, when the school will appear in front of the NCAA Infractions Committee. Does this mean that, if the Committee imposes much harsher penalties than proposed that this year’s Trojans could actually still play in the postseason? Charlotte’s Shamarr Bowden, a freshman shooting guard averaging 5.7 PPG in ten minutes per game, will transfer from the school to a destination unknown. Former Ohio State guard Walter Offutt has transferred to Wright State, and Georgetown forward Nikita Mescheriakov is enrolled at Wake Forest. Mike DeCourcy suggests that the problems at DePaul go well beyond Jerry Wainwright and indicts the administration itself. His point about firing Wainwright in the middle of the season after an 0-18 Big East slate is a great insight. More aftermath from the Tennessee upset over #1 Kansas on Sunday, including Parrish’s take on Skylar McBee and how he’s living his dream at Tennessee. As for Kansas, maybe they should have taken more half-court shots during the game. They seem to be pretty good at making them.